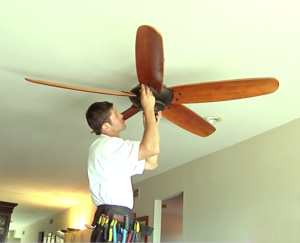 Orr Electrical can install your ceiling fan at any height, anywhere, even if there is no existing fixture. Our workmanship is top rated and we offer a lifetime warranty on all of our ceiling fan installations, so you can always feel cool and secure. Choosing the right ceiling fan depends on varying factors. Larger fans can overpower a smaller room, while spacious rooms with vaulted ceilings can swallow up a smaller fan. The size of the fan’s motor in conjunction with the size of the room will also determine the effectiveness of your fan’s cooling range. Summertime is the perfect season for enjoying a new ceiling fan. The circulatory breeze offers a natural cooling effect that will limit the need for expensive air conditioning. On the warmest days of summer, using your ceiling fan in conjunction with air conditioning means that you can keep your system at higher temperatures, which will cut costs on your monthly electric bill. Ceiling fans are not just for summer. In the winter time, you can conveniently set your ceiling fan to the reverse mode. As heat rises, your ceiling fan will re-circulate the air around the room, so you can reduce heating costs by lowering heating temperatures and the duration you will need your heater. Bill has been helping homeowners and business with their electrical service need for more than 25 years. What town are you located in?